Recently a good friend of mine, Esther, visited from Canberra. 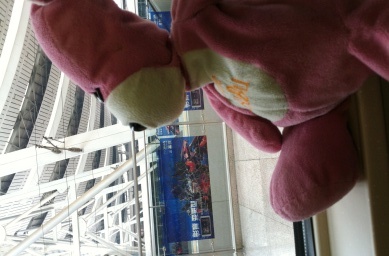 We travelled together, to Shanghai and Sichuan, as well as some touristing in Beijing. It was soooo good to see her, and so fun to travel together. We saw some amazing stuff! I have already posted a bunch of photos on facebook – if you don’t have facebook, let me know and I’ll send you a link so you can see them without it. I have been to the Bund and Yu Gardens twice in the past, but a long time ago – October 1999 and July 2004. It was nice to play tourist again. 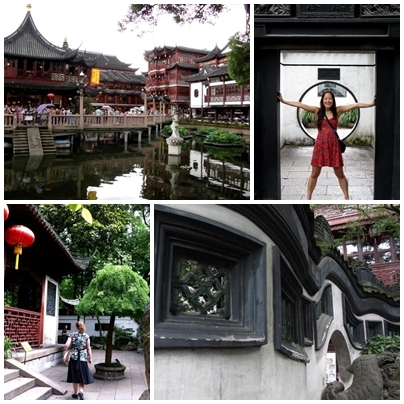 Yu Gardens were as beautiful as I remembered, and we took a lot of photos. One fun thing about these gardens is that I have (scans of) photos my parents took there back in 1983. I love how their pictures of Shanghai and Beijing are recognisable to me now – I can tell where they were when they took them. I had never been to the City Gods Temple before. 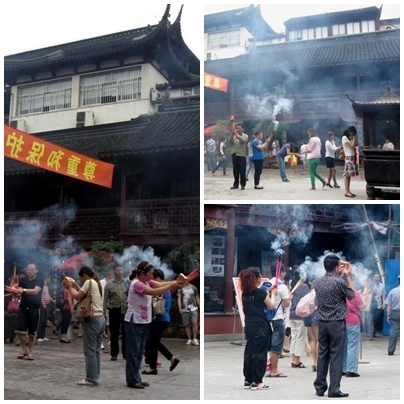 It was originally the site of Jinshan temple, and became the City God temple in 1403. It was a Taoist temple from 1951 until the Cultural Revolution, and didn’t reopen as a temple until 1994. It was reopened in 2006 after a big restoration, so that might be why it hadn’t been on my radar on previous trips. The temple is dedicated to three main city gods, but there are dozens of others recognised. Many were people who served the city in life, made city gods in death. You can choose gods of wealth and prosperity, gods of education or business, or gods that have the same zodiac sign as you. There are lots and lots of smaller halls with different groupings of gods. It’s really more akin to ancestor worship than “gods” as western civilisation thinks of them.